In an environment that is increasingly dominated by disruptive, fast-evolving technology, professional communicators are confronted with ever new challenges and opportunities. Continuous and accelerating change is the new normal. Social media and smart devices have completely changed the playing field of PR within just a few years. Paid, earned, shared and owned media become one and the same in a user’s experience. At the same time, there is growing evidence that the way in which we pay attention and are affected by information is much less conscious and rational, and much more instinctive and affective, than we realise. Join us on May 16, 2019 at 9 a.m. ET for a webinar presented by IPR Measurement Commission members Ana Adi, Ph.D. from Quadriga University, and Thomas Stoeckle, host of the Small Data Forum Podcast. In this webinar, they will address skills and capabilities requirements for successful communicators of the future. They will also teach you about the latest thinking regarding systematic data-led planning and execution of communication activities, as well as examples of measurement and evaluation best practices. This webinar was presented by the IPR Commission on Measurement and Evaluation in coordination with AMEC’s North America Measurement Week. 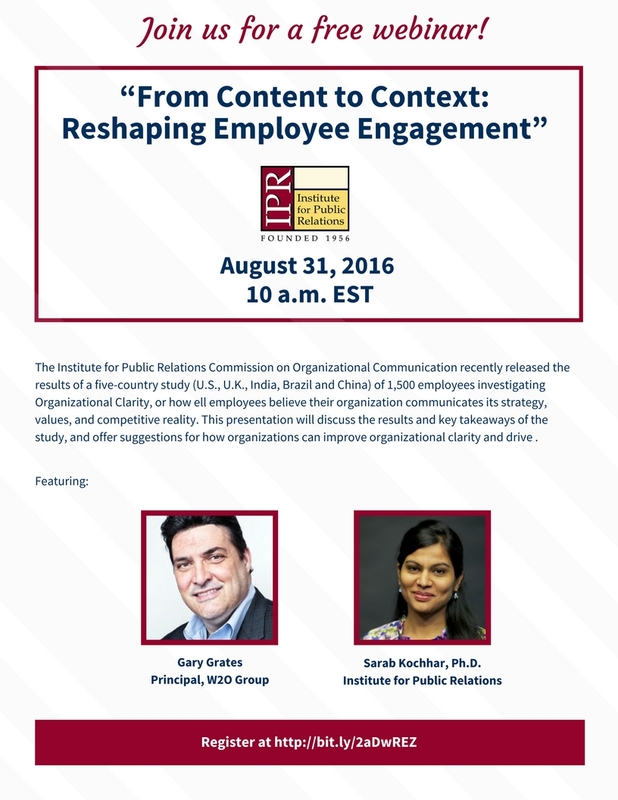 For too long, the focus for internal communications has been building and measuring employee engagement. But what exactly does this mean, and how do you raise employee engagement? Organizational Impact (if and how internal communication has influenced organizational performance). Recently codified by Sean Williams, Julie O’Neil, and their colleagues (see the February 2018 PR Journal) each grouping has specific standards that can be measured independently of each other and thus be tackled for improvement in many ways—words, symbols, actions, etc. All together, these 21 standards might define “engagement” but without measuring them independently, we really won’t know the root cause of an engagement problem. This session examines the 21 Standards and explore ways that measuring some (or all) can start a change effort all on its own. In this first part of a two-part study, KPMG and the Institute for Public Relations (IPR) conducted a series of focus groups with female and male executives and mid-level leaders in agencies and corporations to find out their views on mentorship, leadership, work-life integration, workplace policies, and their ascension to the top. Both groups gave solutions for how to boost women in leadership in the profession. The results may surprise you! One of the most exciting areas of research today is how behavioral science can help us better understand stakeholder decision making and behavior. This webinar will provide an overview of the promising areas of research in behavioral science and its application in organizations, specifically communications and marketing. Best practices, case studies and examples of behavioral science research from multiple perspectives will be presented. Many Chief Marketing Officers (CMOs) and Chief Communications Officers (CCOs) are now leading the way to give their organizations a social voice, both internally and externally, with employees, customers and clients. Companies are more comfortable with uncertainty and are spending more time addressing social topics that may, or may not, be related to their core business but are guided by their organizational principles and values. Our special guest presenters—Southwest’s CCO, Linda Rutherford, and Peppercomm’s co-founder and CEO, Steve Cody— will share their adept perspectives of the shifting roles as a result of the current volatile social, cultural and political climate and will discuss the findings of our third study co-branded with Peppercomm. Millennials now represent the largest generation in the work force (35%), and they will be leaders in organizations and in the public relations profession for several decades. It’s no secret that Millennials place importance on diversity and inclusion (D&I) when considering a new job. 47 percent of Millennials consider the D&I of a workplace an important criterion in their job search compared to 33 percent of Gen Xers and 37 percent of Boomers. Reputation is another top priority for Millennials when it comes to their careers. They place a higher value on building and maintaining a positive digital presence as a reputation booster at work compared to the other generations. One in five Millennials believe both their work and social media reputations are equally important. Join Chief Reputation Strategist of Weber Shandwick and IPR Trustee, Leslie Gaines-Ross, and IPR Director of Research, Dr. Sarab Kochhar, with Millennials Josh Ferrari and Maddi Messner as they discuss and analyze the stigma around this age group and what they really seek out of a workplace. communications. Recent studies on important issues such as leadership communication, internal use of social media, change communication, etc. will be reviewed and discussed. Download the full video of the webinar here.